Ok… I’m totally excited with this. Woke up this morning feeling fine… checking my emails I became excited… My “FREEDOM”, the upper portion of one of my Portraits, original size of 72×26, has not only won one of the 14 Inspirational Awards in the The Peace Project 2012 show…. 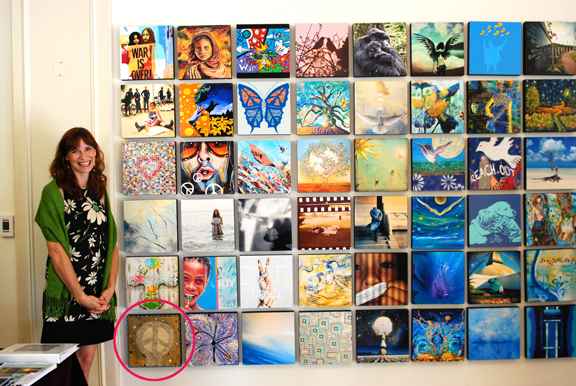 “Freedom” will also be one of the 156 pieces in the traveling show…. woohoo… There were over 500 entries from around the world. Karrie Ross: Portraits "Freedom"; 72 x 26 original piece; acrylic, felt pen, oil, pencil on canvas. 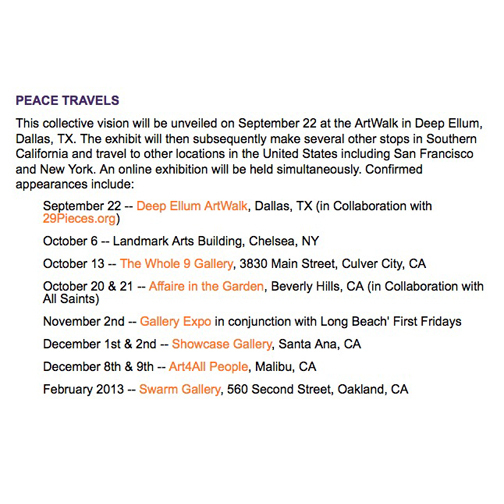 Has been chosen as one of the 156 pieces for the traveling show for 2012. The display is of 1' x 1' images on a wall. . .
SHOW DATES for PEACE PROJECT Portraits "Freedom"; 72 x 26 original piece; acrylic, felt pen, oil, pencil on canvas. 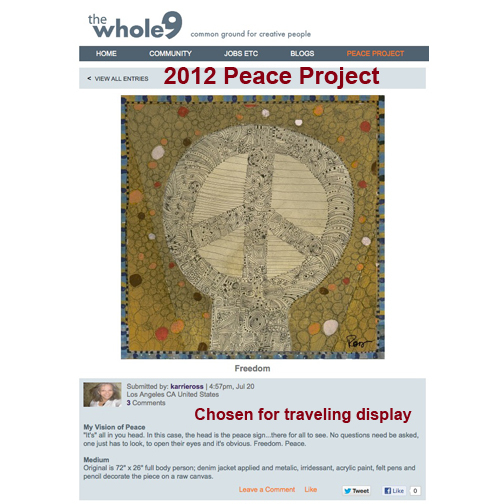 Has been chosen as one of the 156 pieces for the traveling show for 2012 . . 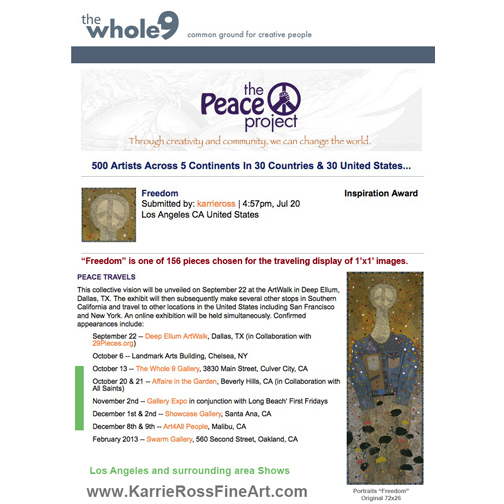 This entry was posted in Awards, Exhibition Posts, Notes: Karrie Ross, Portrait Notes and tagged art award, los angeles fine artist, Notes: Karrie Ross, the peace project, the whole 9, traveling art show on September 11, 2012 by Karrie. Awarded an Honorable Mention in the show: Energy Blooms: “Expanding”. 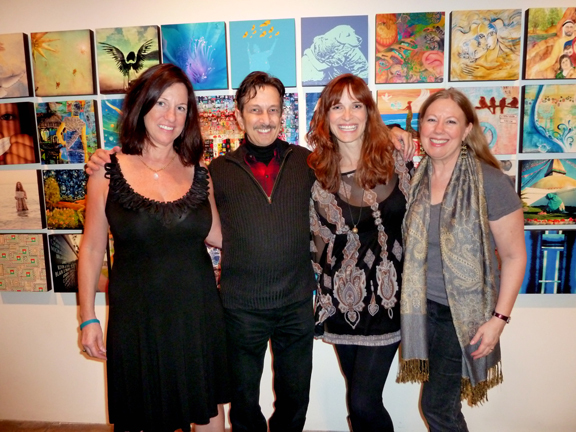 The Topanga Canyon Gallery 2011 Juried Open has selected the Spiral Series: Energy Blooms: “Expanding” to be included in the Annual Awards Show. 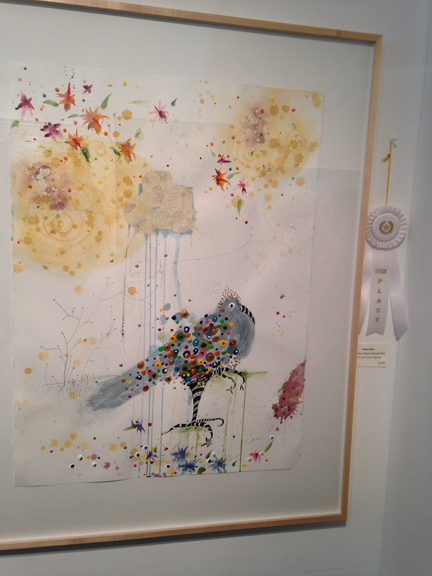 This years show was juried by Craig Krull, owner Craig Krull Gallery, Bergamot Station. The Show can be viewed from January 12 through February 6, 2011. 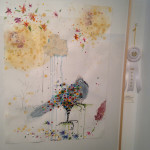 The Artist Reception and Awards is on January 23, 2-5pm at the Gallery. The Energy Blooms series sub-set ‘happened’ with the purchase of a new brush. Oh, how I love brushes and this one called to me from across the art store… from of all things, the sale table! When I saw it, I thought, “How could a brush like “this” be on sale?” I picked it up, played with it on my hand, face, and the table. Held it close and at then the end finding a balance. I then started applying imaginary paint to an air canvas. I fell in love and bought it…the brush! This entry was posted in Awards, Exhibition Posts, Notes: Karrie Ross, Spiral Series and tagged 2011 Topanga Canyon Gallery Juried Open, Craig Krull Gallery, los angeles fine artist Karrie Ross, Sprial Series: Energy Blooms: "Expanding" on January 15, 2011 by Karrie. There were over 2,300 entries from 1,300 artists from 35 countries. 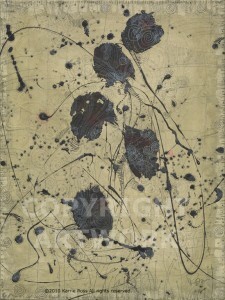 Tour begins at The Naples Museum of Art in Florida from Tuesday, February 1, 2011 through Sunday, April 10, 2011. A tour of selections from the exhibition is being organized by David J. Wagner, Ph.D., Curator/Tour Director, for display at other museum venues throughout the United States. 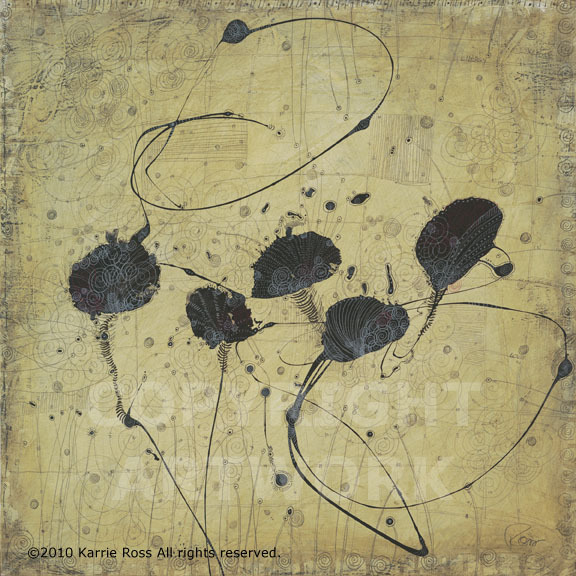 This entry was posted in Awards, Exhibition Posts, Notes: Karrie Ross, Spiral Series and tagged award shows, Blossoms II, honorable mention, los angeles artist, Notes: Karrie Ross, Susan Kathleen Black Foundation on November 12, 2010 by Karrie.